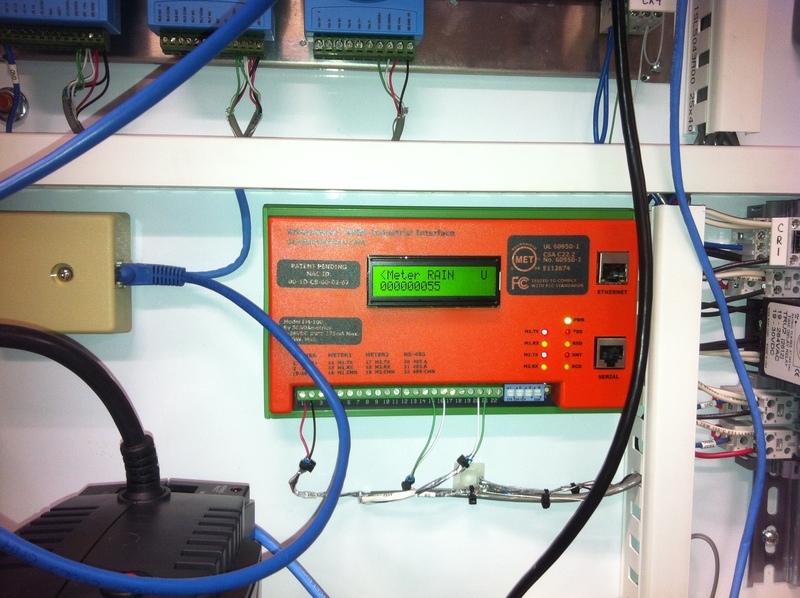 This article describes how to use an EtherMeter to connect a Tipping Bucket Rain Gauge to a SCADA System, yielding a realtime rainfall measurement system that communicates using Modbus, DF1, and EtherNet/IP. RG600 Tipping Bucket Rain Gauge. This rain measuring instrumentation was a component of the new SCADA System at the DesMoines & Mississippi Levee District (Alexandria, MO). The electronics were installed at the Levee District’s new Pumping Station, where accumulated water within a network of ditches is pumped over the levee and into the Mississippi River. The station has a pumping capacity in excess of 100,000 GPM. 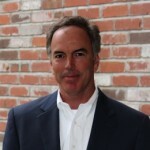 In this application, the Rain Gauge was an 8 Inch Tipping Bucket, Model RG600, manufactured by Global Water (Gold River, CA). 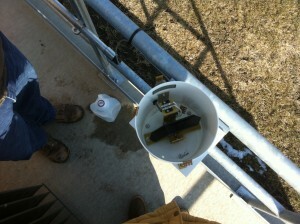 Internal View Of the RG600 8 Inch Tipping Bucket Rain Gauge. The RG600 provides a contact closure for every 1/100 inch of rainfall; and the contact output was interfaced to one of the EtherMeter’s pulse input channels. The EtherMeter was configured to measure total accumulated rainfall (1/100 inch increments), as well as the realtime rainfall rate (inches/hour). The data was transmitted to a master RTU using Modbus/RTU over RS-485. Two Keller America “AccuLevel” submersible pressure transducers for measuring water levels within the ditch and the river. Three ADAM-4000 multichannel analog and digital I/O modules. 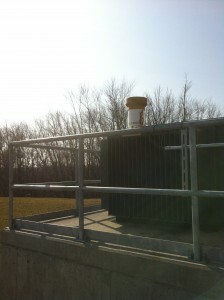 Rain Rate (Inches/Hour) was measured and transmitted to the SCADA System. 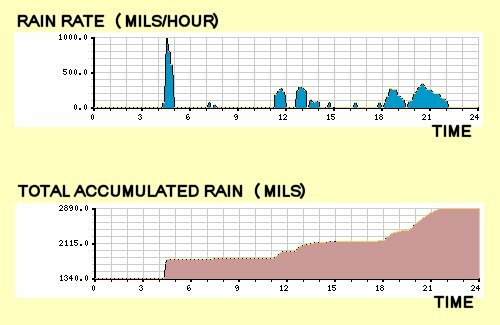 Rain Total (Inches) was measured and transmitted to the SCADA System. Screen Snapshots Of SCADA Rain Data That Was Collected By The EtherMeter.